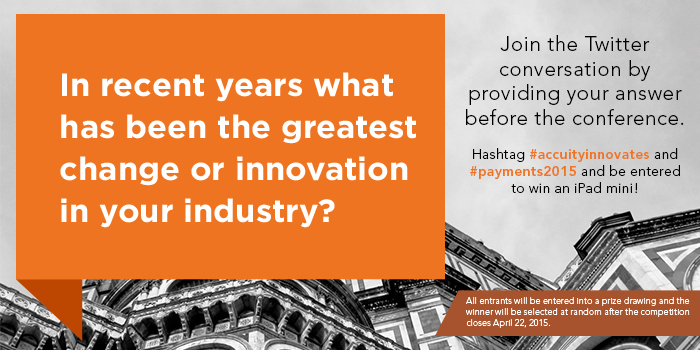 Stop by so we can share our knowledge in payments best practices and learn more about the biggest challenges in the industry today. We are also happy to provide insight on how our solutions empower organizations to improve counterparty, payments, and AML compliance data operations. Whether you are interested in our solutions, eager to hear about the latest trends in the industry or just want to add your name to our iPad-mini raffle, we are excited to meet you. We are dedicated to keeping our data up to date by collecting our data from multiple authorised sources from around the world. Where there isn’t an official central source—like in some emerging markets—we go directly to the bank to collect data. Accuity adheres to a strict data collection methodology that operates on a 90-day Standard Settlement Instructions update cycle. We reach out regularly to the more than 50,000 financial institutions worldwide to gather data—our reach is beyond any other network. Accuity provides more payments data than any other provider and proactively gathers this information from a greater number of financial institutions, monetary authorities, regulators and banking associations globally. With Accuity you will recieve optimized payments data that includes full branch code identifiers for the codes, additional bank code sets for the same country and national bank code to SWIFT/BIC pairings in order to facilitate commercial payments and expand on the payment routing options available to the bank. We provide the solutions through flexible delivery options, ranging from managed services, stand-alone look-up tools and data files all the way to hosted and installed web services. Accuity has been providing solutions to banks and businesses worldwide for more than 175 years and we have over 15,000 customers worldwide spanning across 165 countries.